SoHo ("South of Houston (Street) is a gentrified New York City neighborhood known for it's hip reputation, artist lofts and art galleries, and more recently, a variety of shops, trendy boutiques and upscale chain stores. In the recent years, SoHo has become too expensive for many artists to afford space. 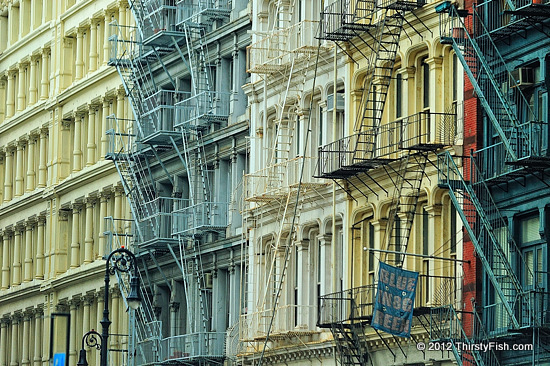 With over 200 buildings, SoHo has the greatest collection of cast-iron architecture in the world. Before the advent of steel, mainly between 1850's and early 1900's, cast-iron became popular in architecture because it could be forged into a many shapes and designs, allowing for elaborate facades. Many of SoHo's cast-iron buildings have Neoclassical or Romanesque designs. However, cast-iron is structurally weak in tension and bending, and, has a tendency to crack when heated and quickly cooled. Steel frames, concrete and glass have become the materials that define modern architecture.